Dandi, January 30: “Dandi March has played a significant role in the Indian Independence. Earlier India was seen through the British spectacles. It is after the 1930, when Bapu was chosen as the person of year, that the world began recognising the robust India”, said PM Narendra Modi in his day long visit to Gujarat on Wednesday. Modi after inaugurating the Venus Hospital at Surat, visited Dandi in Navsari District on the coast of the Arabian Sea wherein 1930 Mahatma Gandhi had ended his historic Salt March. He dedicated the National Salt Satyagraha Memorial in Dandi to the nation. “The National Salt Satyagraha Memorial to be dedicated to the nation on Mahatma Gandhi’s death anniversary has statues of Mahatma Gandhi and 80 Satyagrahis, who had marched with Mahatma Gandhi during the historic Dandi Salt March”, he said. 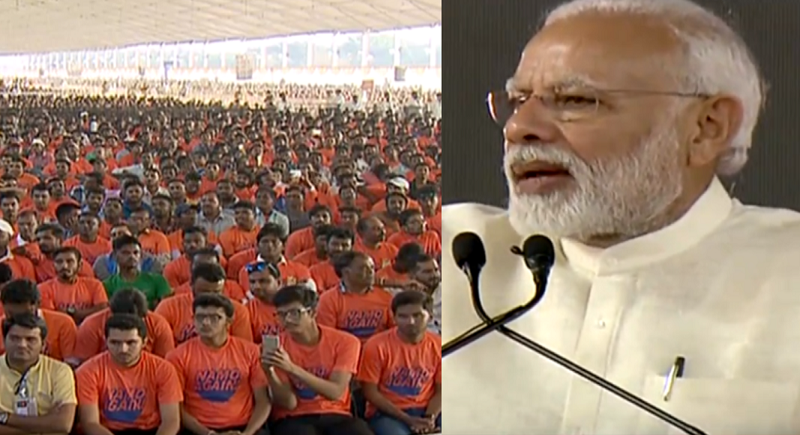 Citing the occasion, Modi hailed the importance of cleanliness saying, “It is under swacchaa bharat abiyan that more than 3 lakh people have been cured of their diseases. Bapu spent his life spreading awareness and significance of cleanliness. If the reigns earlier had worked towards the cleanliness in the nation, that would have been a greatest tribute to Gandhiji”. “Last year on his death anniversary, we urged thousands of international singers to record ‘vaishnav jan ko..’, they did and got connected to the Indian culture and society. This is the NDA government connecting the nation worldwide. Khaadi was out of fashion in the past few years. We in the last four years, have encouraged more than 2000 organisations to promote and use cloth material. It has now become a fashion and 5 lakh people are indirectly benefitted because of this. The women are being empowered using this up right”, the Prime Minister said. Even the charkha, which was the prime instrument of Gandhi ji, has been given undeclared significance. The government has decided to celebrate 7th of August as the national Charkha day. We have connected Gandhian values with the modernity. Mission solar charkha projects are on the verge of completion. The solar power will reduce the use of man-made resources and more than 1 lakh will get the employment, he added further. The memorial at Dandi has 24-narrative murals depicting various events and stories from the historic 1930 Salt March. The Salt Satyagraha, known as the Dandi March has been a landmark event in the history of India’s freedom struggle. Mahatma Gandhi had launched Civil Disobedience Movement against the British rule. 80 Satyagrahis with him marched 241-miles from Sabarmati Ashram to the coastal village Dandi and broke the Salt Law imposed by the British.